The main Chart Properties dialog allows you to control your chart, drawing tools, and technical indicators. 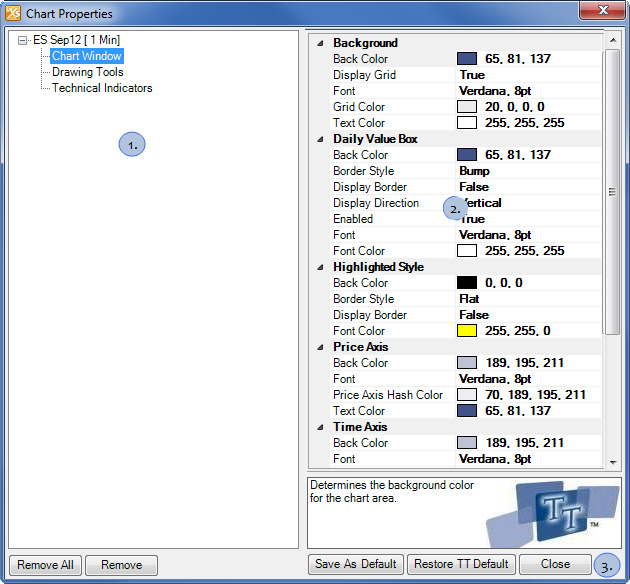 The Chart Properties dialog is accessed by right-clicking a chart and selecting Properties from the context menu. The chart properties tree allows you to quickly locate and manage your chart properties. Chart Window: Contains the default properties for how the chart displays. Drawing Tools: Displays the drawing tools that have been applied to the chart. Click the drawing tool name to display the associated properties. Technical Indicators: Displays the technical indicators that have been applied to the chart. Click the technical indicator name to display the associated properties. Removes the selected drawing tool or technical indicator. Removes all drawing tools and technical indicators that have been applied to the chart. Contains the properties for the chart window, drawing tool, or technical indicator. These properties will vary depending on the which has selected. To change a property type in the new value or use the drop-down button to select a new value. Saves the properties values as the default values for their subsequent application. Restores the properties values from the original X_STUDY install. Save and close the Chart Properties dialog box.